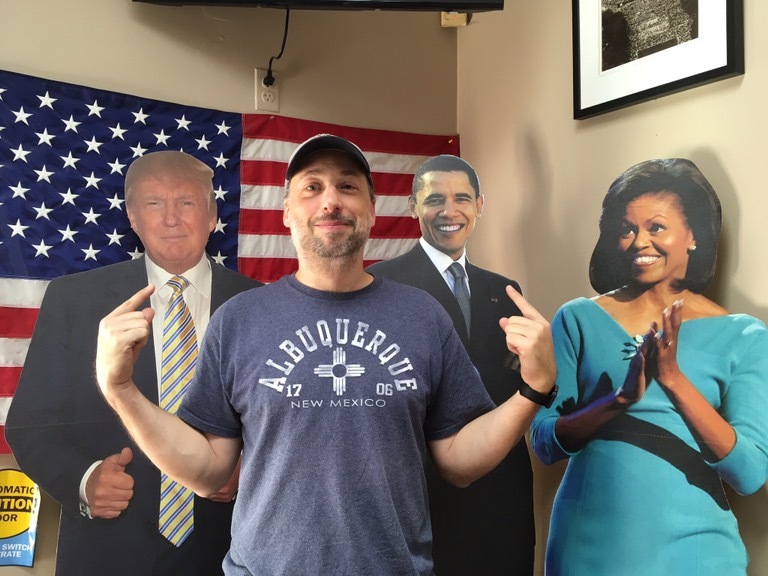 DC part Deux and the election to remember – Live MoHo! 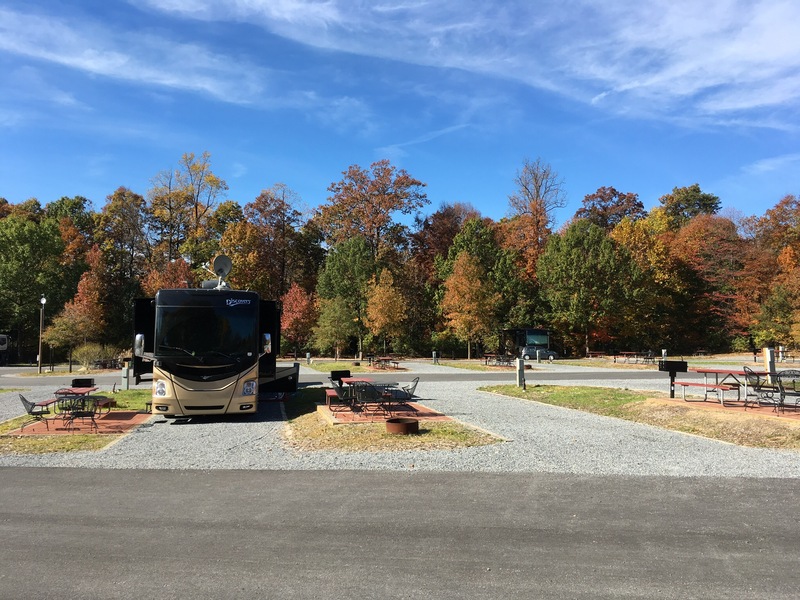 We had to pass through Washington DC on our way south, and we have booked the same Cherry Hill RV Resort that we enjoyed on our first trip through DC a few months ago. It is expensive, but very nice. It is also located conveniently just one exit on the Beltway from the end of the Metro line. We were scheduled to stay for 3 nights and then leave on Sunday November 6th. 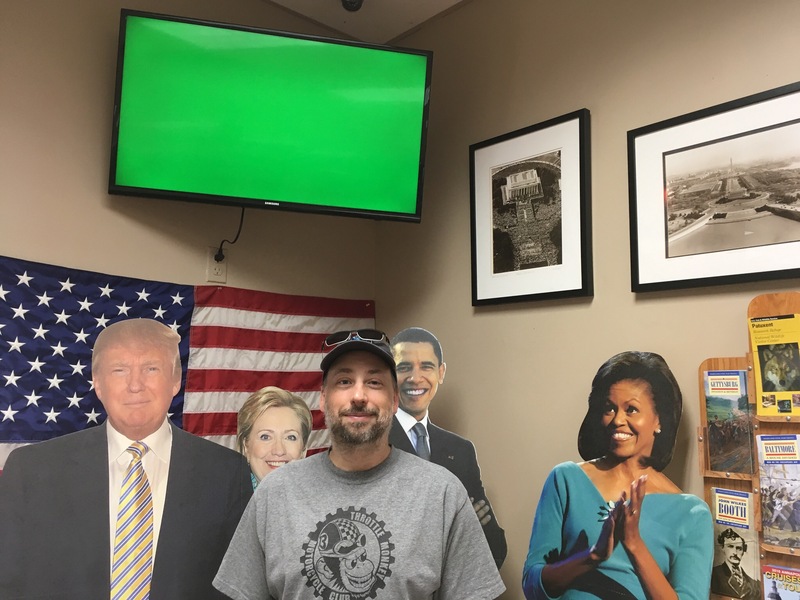 When we went into the office to check in we found carboard cutouts of Trump and Hillary had joined the cardboard cutouts of Barack and Michelle. We checked in – but the light bulb was about to go off. As we walked out to our RV Heather had the great idea – we should stay through the election!! We walked right back into the office and extended our stay for 4 more nights. Now, we could be in DC for election day (Tuesday) but the day after (Wednesday). Front row seats for the big show! We thought the campground might be crowded with other election spectators like us, but it wasn’t. We had the backlot mostly to ourselves. And even better, the trees were showing glorious color! I had to chuckle at the irony of seeing good fall foliage in Washington DC when we went to New England specifically to see the colors only to witness the worst drought in memory there and lackluster leaves. Cherry Hill was definitely getting ready for winter. Everywhere we saw signs of the preparation. 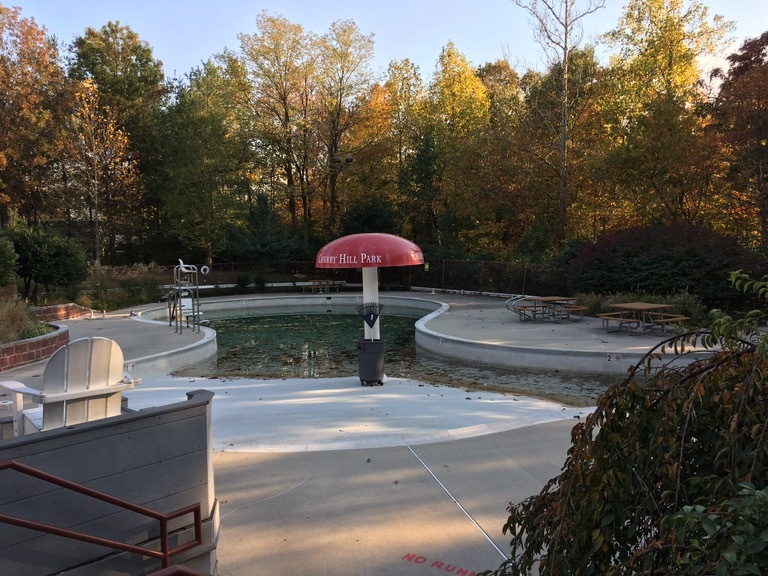 For example, the pool was drained. At least, I think it was drained. Possibly it was half full of water and fallen leaves intentionally as a kind of unheated herbal infusion bath. How would I know? I don’t do yoga. Half filled storm drain or herbal infusion? 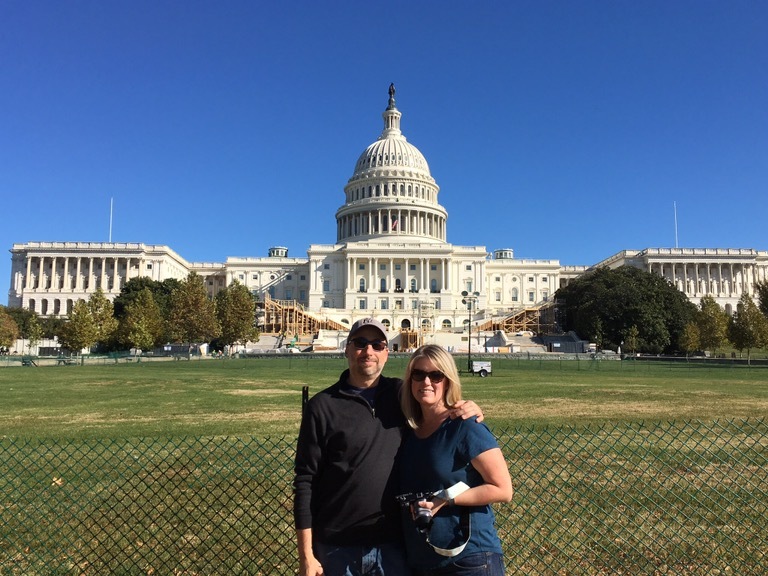 Since we had time before the election, we decided to see some of the sights we didn’t have time to see last time. 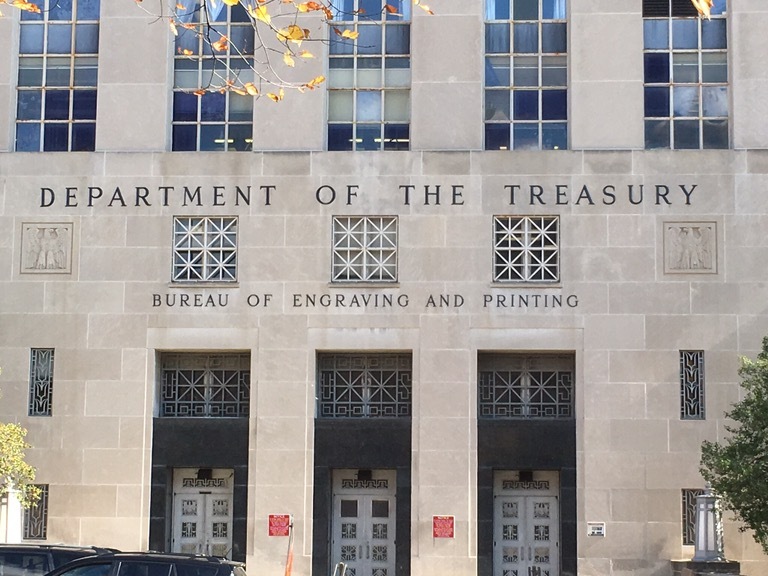 Near the top of the list was the Treasury Department where US paper currency is printed. Tours are free but tend to fill up fast. We went 45 minutes before the first tour starts – they are first-come/first-served – and there were already at least 100 people in line. 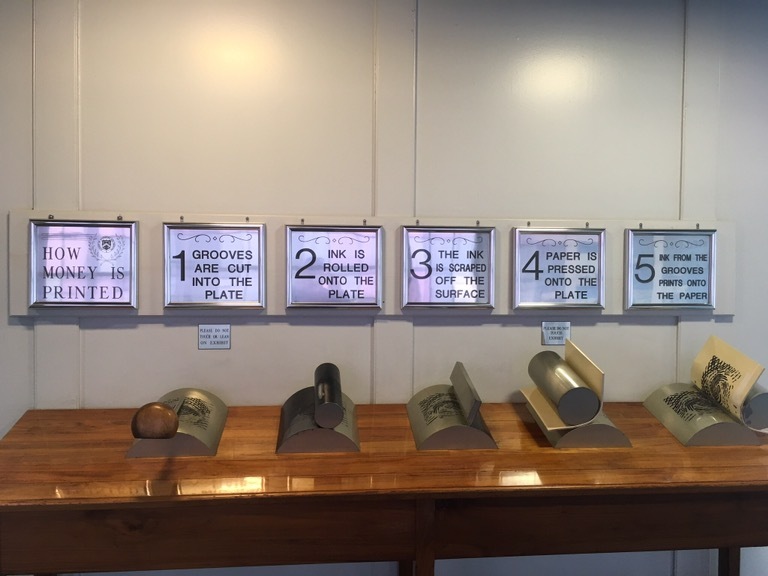 Inside the lobby are various displays of paper currency including the steps used in the printing process. One of the more interesting displays was $1 million dollars in $10 notes sitting in this glass and steel case. In case we were not sure, a small label confirmed the case was alarmed. ‘Cause, you know, I thought it might not be. 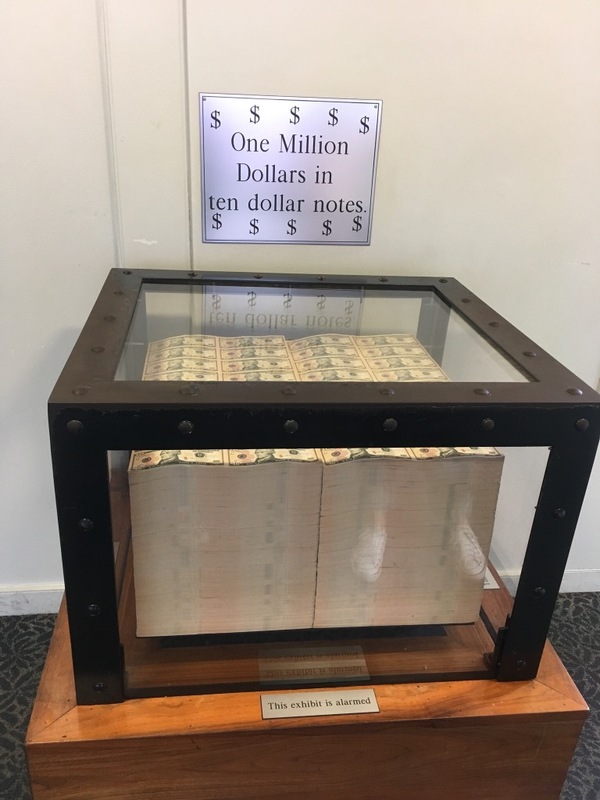 I guess they used $10 bills because one million in $20 bills would be half the size and not as impressive. But if you ever wanted to know what size duffel bag to put your million dollars worth of $10s in, here it is. Once you fill that bag, let me know where it is and I’ll double check it. Because I’ve now been trained by the Treasury department to handle it properly. The Treasury does not allow photographs inside the printing areas, so we don’t have any to share. I will say that the tour was only mediocre. Yes, it was cool to see money being printed, but the printing area is smaller than you might think. 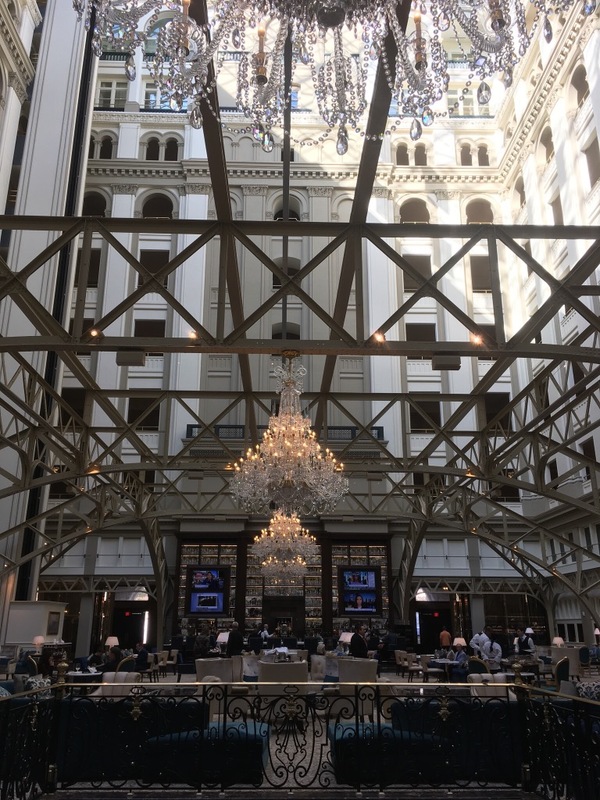 Another sight we wanted to see is the newly-opened Trump International Hotel which is in the old Post Office on Pennsylvania Ave. It was still undergoing its renovation when we were here before. Crews worked to complete the overhaul of the old post office and finished ahead of schedule. 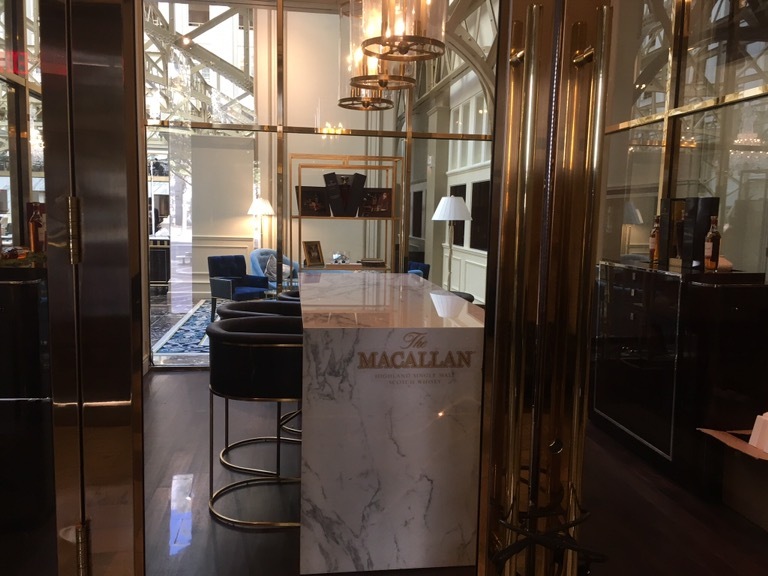 Just inside the entry doors was a room with a marble table and bottles of Macallan Scotch. Evidently this is a high-end whisky tasting room. I’m not sure if it was ready yet. 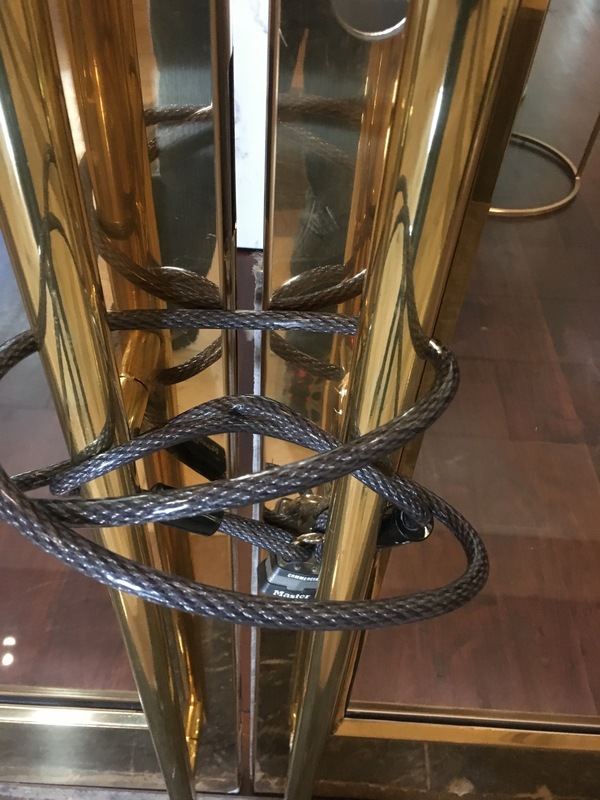 The heavy brass doors were held closed by a very un-Trump-like $10 bike lock. Or, I could be wrong. Perhaps Trump had nothing to do with it. Perhaps a bike owner needed a place to store their bike lock and just hung it on the doors? Or was it the knowledge that Scotch-crazed drinkers might break down the standard doors and the only thing keeping them out was a cable lock? 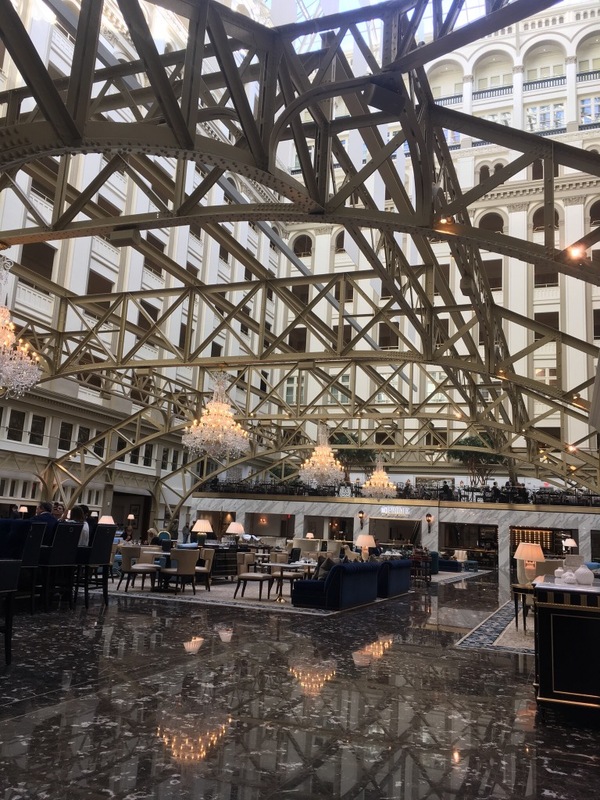 Trump International Hotel lobby is very open and spacious. Fortunately, it was not closed with a bike lock so we walked right in. 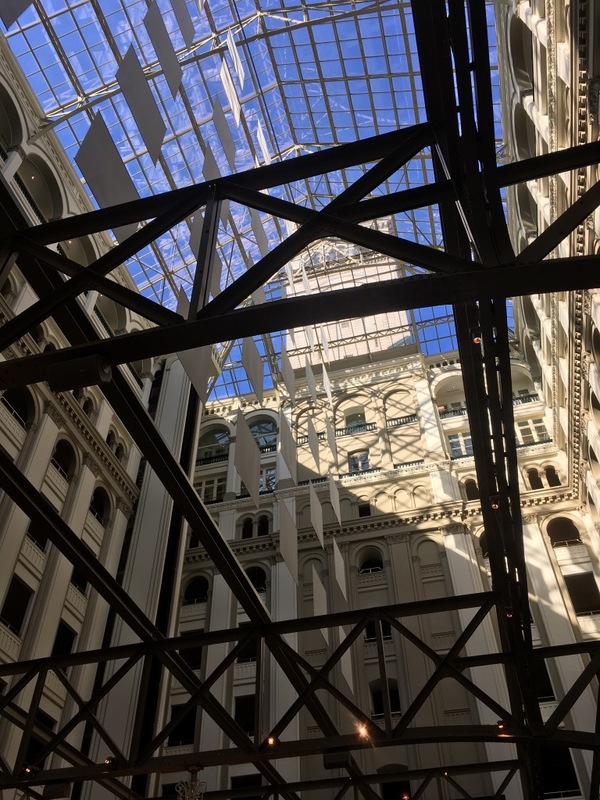 The original open-air courtyard of the post office has been covered with a glass roof letting in views of the natural light. Of course, it wouldn’t be a Trump hotel without some opulence. Crystal chandeliers are suspended from the framework overhead. At one end of the lobby is a bar. Servers were offering champagne and charcuterie to patrons enjoying the plush velour seating. Polished marble floors reflect the lights from the chandeliers, even in the daylight. No doubt the Trump Hotel lobby is impressive. On close inspection there were a few rough edges visible – items that hadn’t quite been finished in time for the opening. A paint drip here, a bike lock there. Nothing that took away from the overall experience though, and hats off to the staff for opening the doors ahead of schedule! 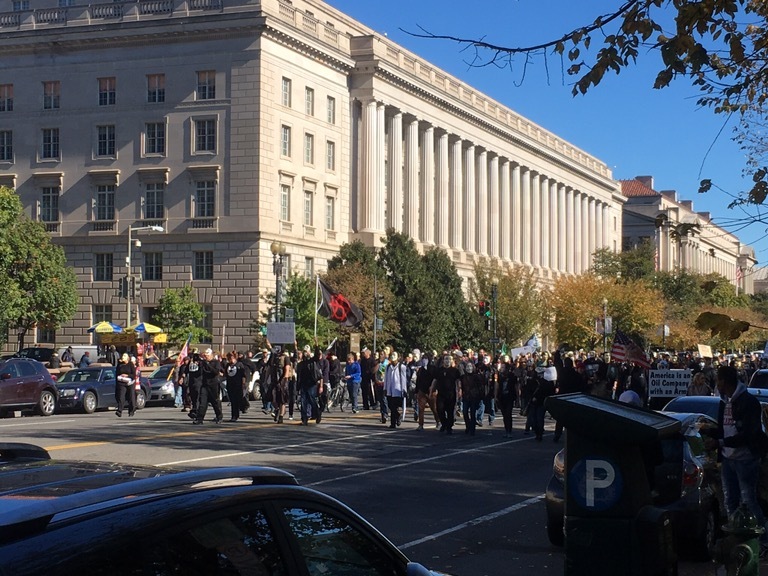 After being impressed by the new Trump International, we walked toward the Capitol and straight into a protest. What appeared to be a group of around 100 people carrying signs was marching up the street. As the crowd approached, we saw that nearly everyone was wearing a Guy Fawkes mask! Because why not, I guess! 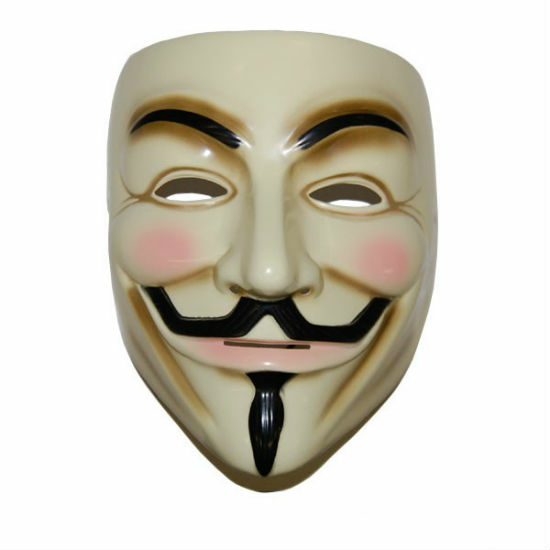 If I ever decide to do a protest, I am totally going to order one of these masks! 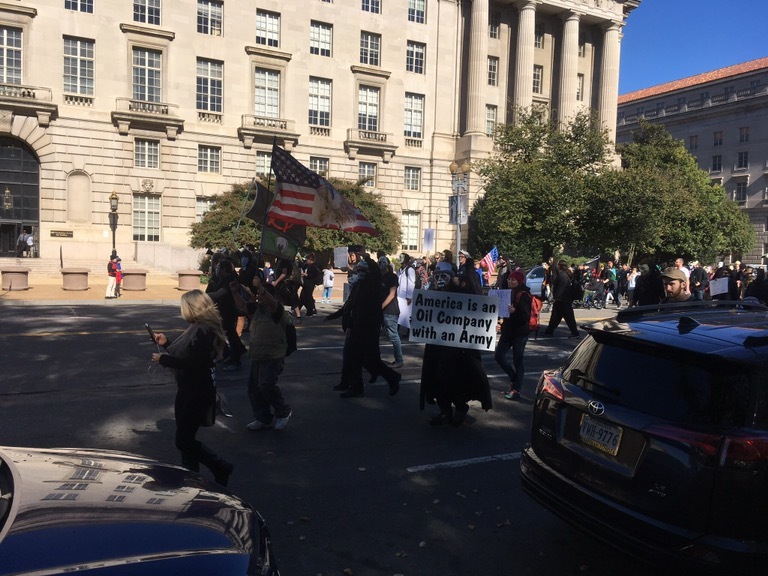 I’m not entirely sure what the protest was all about, but apparently it had something to do with America being “an oil company with an army.” I know this because of my astute and intimate knowledge of various political groups and contemporary issues. And also because that’s what the sign carried by one of the people in the front said. We later heard that some members of this group defaced the Trump hotel we had just seen (spray paint). I guess they didn’t know Trump is a real estate mogul and not an oil tycoon. Or, they just got the wrong building. Could be either, honestly. Those masks really restrict vision! We were heading to the Smithsonian museum of American History. 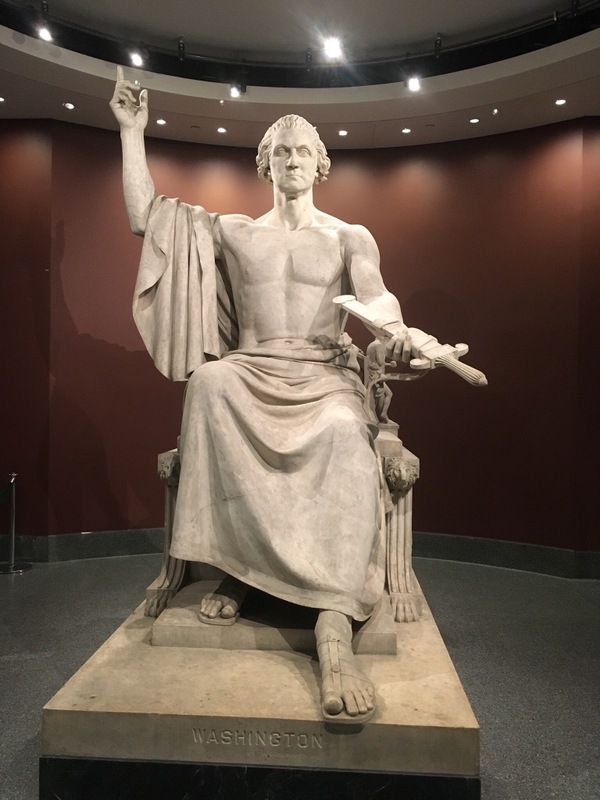 It houses exhibits like Julia Child’s kitchen (her actual kitchen, not a replica), machines and vehicles from America’s past, and some absolutely bizarre items like this status of George Washington as a Roman God. Well, maybe I’m being unfair. George Washington MAY actually have been a Roman God. Someone who paid more attention in history class as a kid should confirm that one. There was a very good transportation section with historic cars, trains, and even an early RV! The collection of steam engines is also impressive, as was the light bulb wing. Their history of American advertising exhibit was neat. They also had an entire wing dedicated to the inauguration gowns of First Ladies (somewhat timely). Ultimately though I would say this museum suffered a bit of mission drift vs. some of the other Smithsonians. We left Georgeus Washingtonus and headed for Georgeus-townus. Known today not by its Roman name but its modern name – Georgetown. Georgetown does not have its own metro station. Various explanations for this have been put forth. They range from the difficulty in reaching this area (including tunneling under private homes), a lack of dense enough population, and the residents themselves resisting (not wanting “outsiders” having easy access to Georgetown). Whatever the reason, the Metro does not go to Georgetown. However….if you take the right path from one of the two nearby metro stations, it is only about a half mile walk. Not too bad. Being Washington DC experts at this point, we turned that into a 1.5 mile walk. I will place some of the blame on Apple Maps which had us walking in exactly the wrong direction and stubbornly refused to tell us simply to turn around. I mean, come on. Making a U-Turn on the sidewalk when walking isn’t a major commitment like it would be in a car. So we kept following the directions and kept not getting to Georgetown. We finally noticed that while the Apple Maps continued giving us directions, the distance to the destination continued increasing. Apple has some work to do on that. 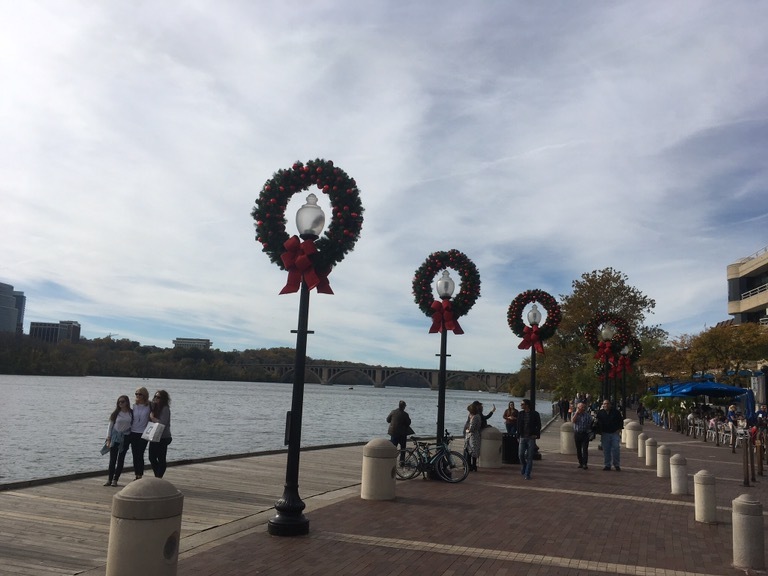 The benefit was that we ended up enjoying a walk along the Potomac which in early November was already completely decked out for Christmas. 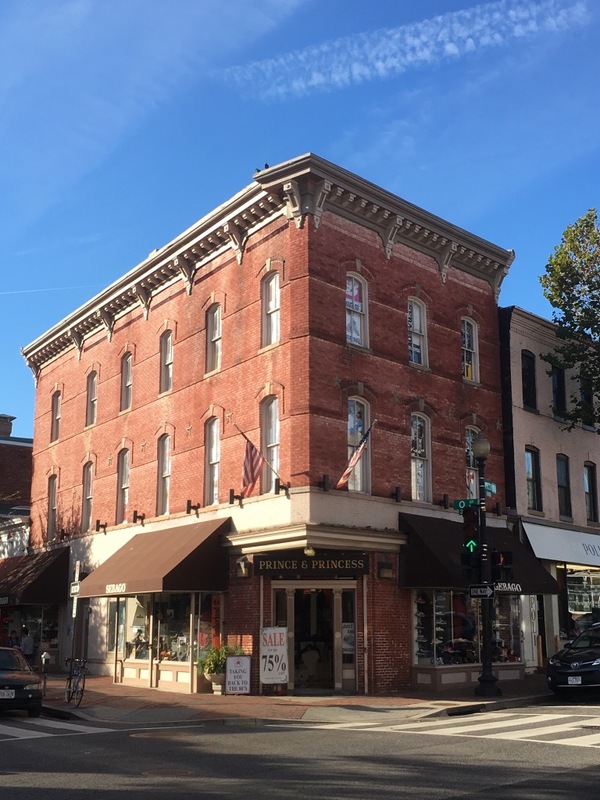 Georgetown has a main street that is full of high-end shops and boutique restaurants. Its a little like the Rodeo Drive of D.C. The stores are very charming, like this multi-story brick and masonry building on the corner. 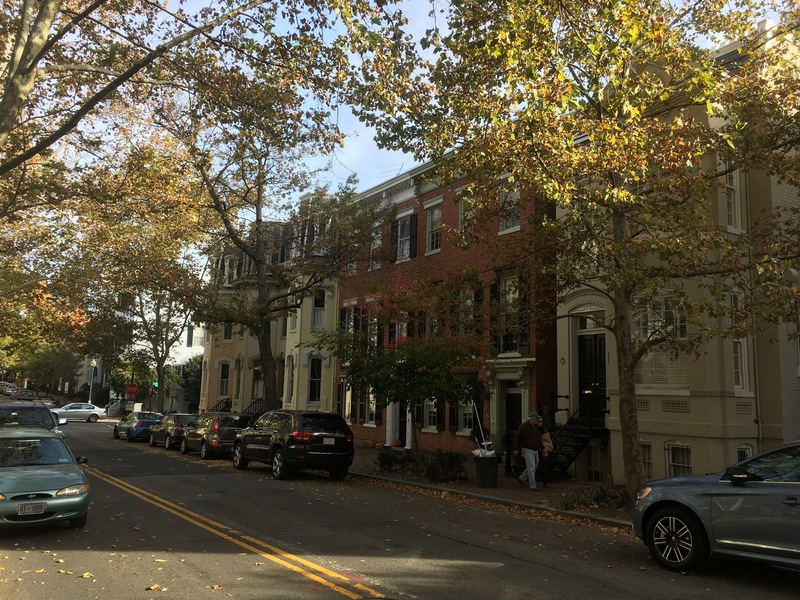 Houses in Georgetown are among the most expensive in the country. Many of them are in the row house style. These small row houses, roughly 1000 square feet, sell for $1.5 million to $2.0 million dollars. Larger detached homes easily top $5m and there are many which fetch well over $15m. We walked around Georgetown for most of the afternoon. It was fun to look at houses with the Zillow app open on our phones and see what places sold for and when they last sold. Many of them have photos of the interiors too. The next day, we took the Metro down to the Capitol. It is now November 7th, the day before the election. I thought that D.C. would be bustling, but it was like a ghost town. Streets that normally fill with bumper-to-bumper traffic were nearly empty. Few people walked the sidewalks. It felt like the whole town was holding its breath in anticipation. We arrived at the Capitol and workers building the platform for the inauguration. You can see it rising on either side of the main building. Next door to the Capitol is the Smithsonian Botanical Gardens. 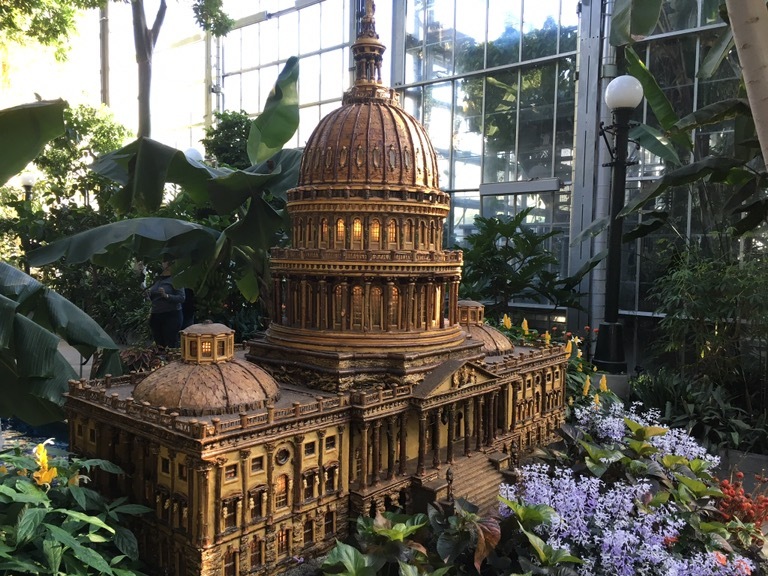 They had their own miniature Capitol made of wood and tree bark. 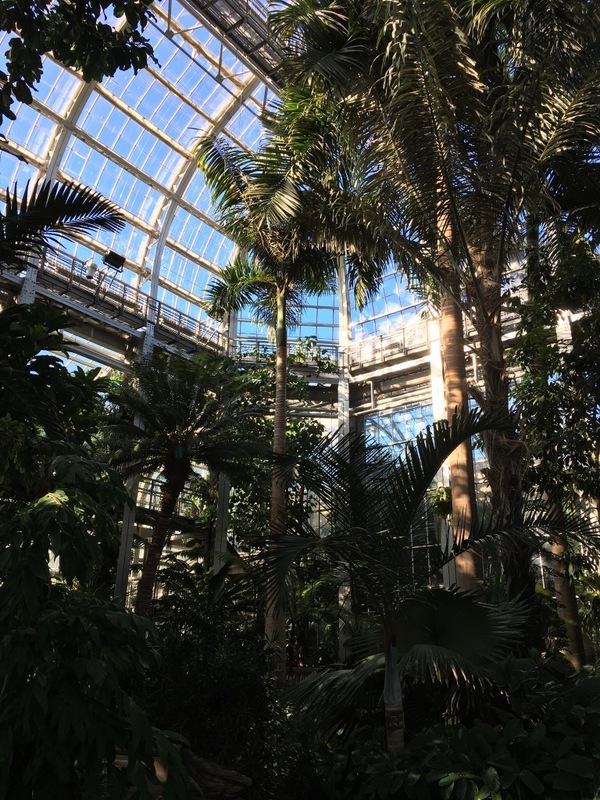 The botanical gardens has each of the temperate zones of the US, from the dry deserts of the Southwest to the subtropical Florida rainforest. The rainforest room was especially impressive. It was easily 100 feet tall inside with a glass ceiling to let in the sunlight. Stairs take visitors up 30 feet onto walkways built through the canopy for a birds-eye view. The gardens were beautiful – a nice oasis in the middle of the city! However, our attention was turned to this election. I’m sure history books will remember the election of 2016. As we drove across the country during the election cycle, we had noticed a few things. During the primaries, nobody wanted to show support for anyone. Compared to elections past, we saw very few yard signs or bumper stickers. With one exception. Bernie. People loved to show their support for Bernie. We probably saw 10 Bernie stickers/signs for every one of the next most popular – Trump. Even in Texas. In rural areas, the Trump signs were the most common signs we saw, especially after the primaries when Bernie was out. We saw at least 10 Trump signs for every Hillary sign out in the country. The one exception was Vermont where Gary Johnson signs were about as common as Trump signs. In the cities, signs seemed to be about evenly split between Hillary and Trump. Polls seemed to show a strong lead from Hillary but our travels suggested that might not be true. Or at the very least, her supporters weren’t as eager to show their support in the open as Trump’s supporters. Everywhere around D.C. we saw signs that this election was different than past elections. One shop had this version of polling data posted on its window outlining how they saw the two choices. 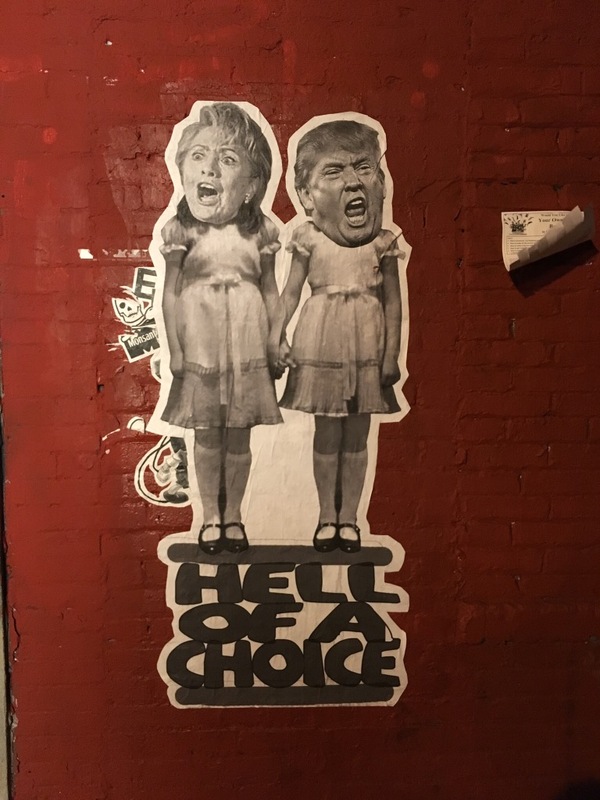 In another neighborhood, this mural was plastered on an alley wall sharing similar sentiment about the two choices. Our plan was to find a place where politicos hang out and go there to watch the election unfold. We wanted to see the cheers and the groans as the states called in with their results. And we didn’t want to pick a location that was tied to a particular candidate or particular party. Finding such a place turned out to be more work than we anticipated. Many bars and restaurants were having “election specials” with unique drinks, craft foods, election-themed desserts, and live election coverage. And, given the eastern time zone, no real results would be known until 9pm or so. Choosing one that would actually have politicos in it was tricky. We ultimately decided to have dinner at one venue and then move to the Old Ebbitt after dinner. 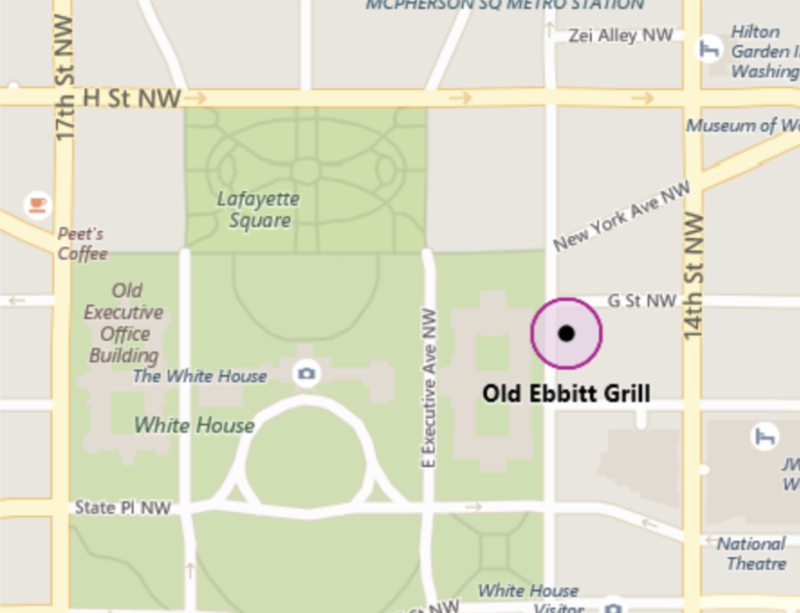 Old Ebbit is – literally – nearly next door to the White House. We boarded the Metro, heading downtown at a time when most commuters were leaving. Our stop is the last stop on the Green Line, so trains full of commuters arrived and everyone got out. Just a few of us got on. D.C.s metro system is the best we’ve ever seen. It makes the NY subway look like a relic, and beats the London Tube and the Paris Metro as well. Tonight it would be our ride to the big show! We stepped off the metro and walked toward our dinner restaurant. Along the way, we saw signs that the election festivities were underway. 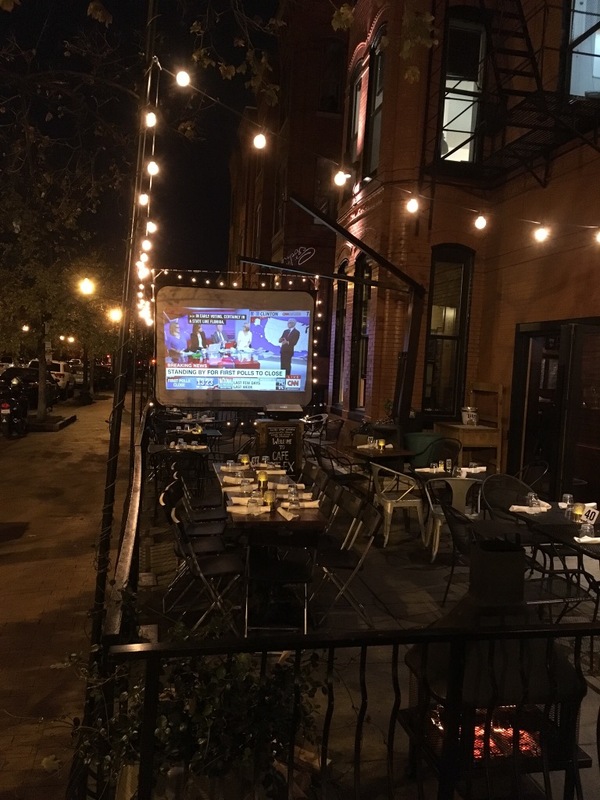 Weather was relatively mild and many of the outdoor seating areas had turned into election night specials. News coverage started at 7:00pm, but the crowds didn’t start to appear until later. Our dinner venue had a huge private party – probably 40 people – who booked an entire room and were watching the results come in. It looked like a lively party, but it was private. We walked a mile or so to Old Ebbitt. It was busy, especially the bar area. A new crew was there, or at least a cameraman. He was capturing the crowd. A TV had been mounted at one end of the bar tuned to the results. Old Ebbitt had the station tuned to CNN, so I loaded the CNN app. We watched it like the MLB app during the World Series. And it kind of was the world series of politics, I suppose! The time difference was working against us. We arrived around 9pm and at that point it was nearly a tie between the two. However, very few states had yet called in at that time. As the evening wore on, the bar became more somber. I think partially because people were surprised that the results weren’t so clearly favoring Hillary like the polls predicted, and partially because it was getting pretty late. 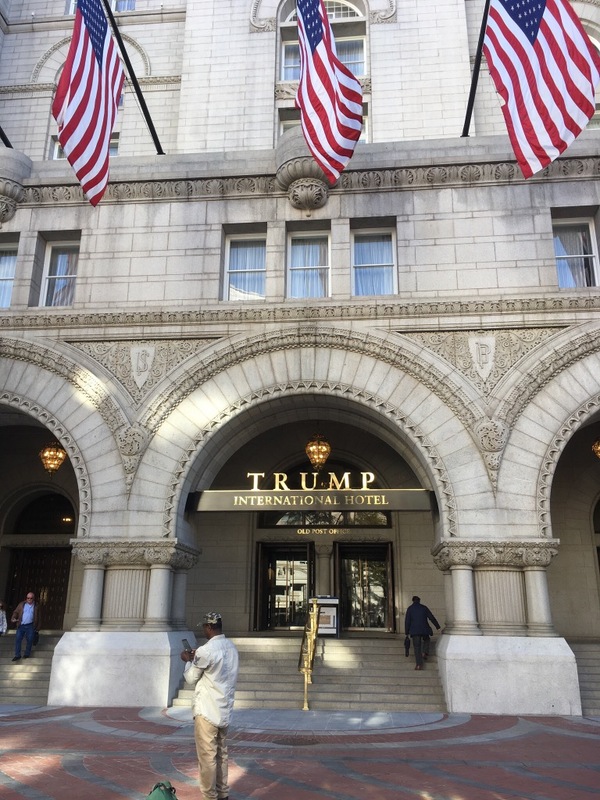 People don’t like change, and I have a feeling the majority of the people at Old Ebbitt work for the Government in some capacity, or are dependent upon it indirectly (lobbyists, suppliers, maintenance workers, etc). 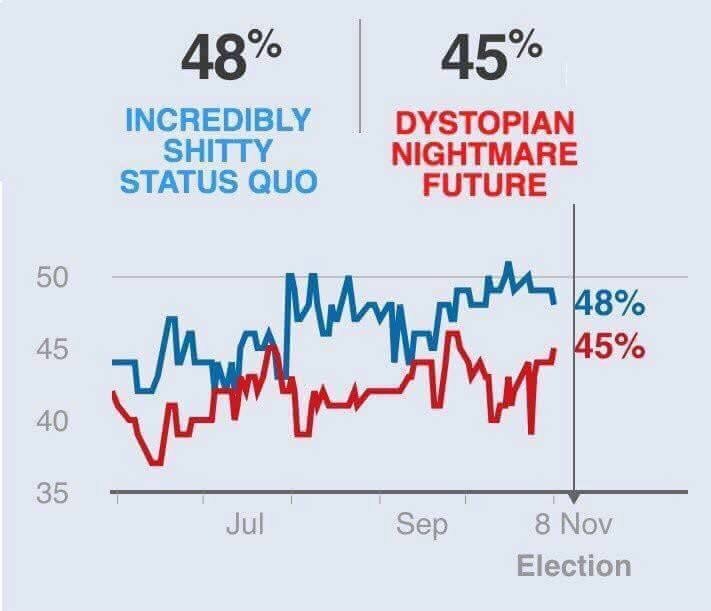 They were starting to wonder what might actually happen if Trump won. 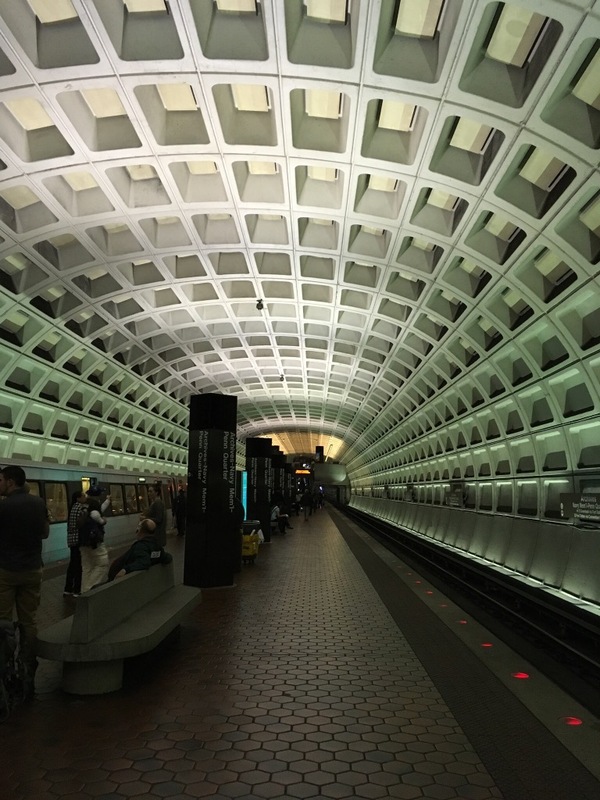 Bars close at 2am in D.C. but the metro stops running earlier than that. We left around midnight, and we weren’t alone. 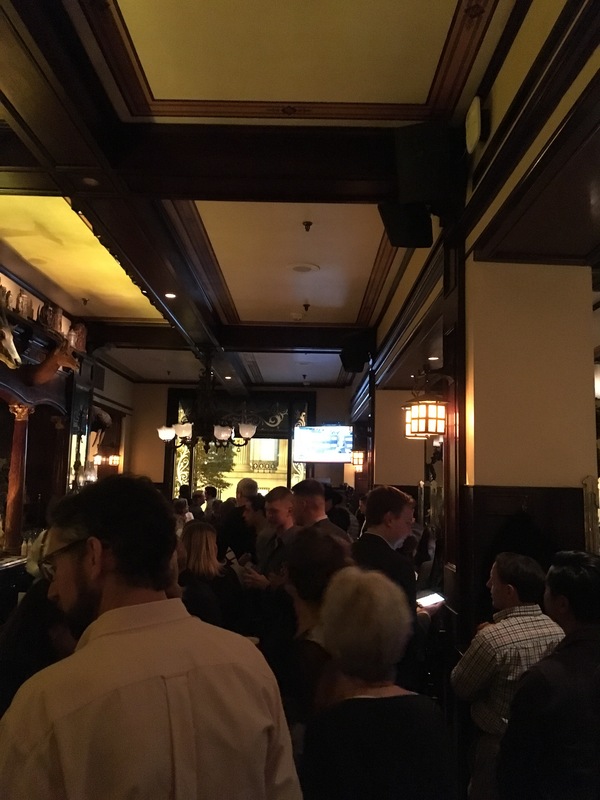 The crowd at Old Ebbitt had thinned a bit. We headed back to the metro and back to the campground. At that point, Trump had a small lead but neither candidate had it locked up and the race was still on! Around 2am, we dozed off. The next morning, we saw the results. Every poll had it wrong!! Talk about a major upset victory! Trump had been saying for weeks that this was like Brexit and the polls were wrong, and he turned out to be completely correct! We had to stop by the campground office and we saw that they wasted no time in removing the Hillary cutout. Staying in D.C. for the election was pretty cool! This was definitely an election for the history books especially with its completely unexpected outcome that all the experts failed to see coming. Well, except for those LA Times guys. They had it nailed. We’ll be pulling out of D.C. just as President-Elect Trump arrives to meet with President Obama in the White House. Given the traffic, we’ve scheduled just short of 90 miles to put us outside the D.C. orbit. We’ll head around the Beltway and then south on I-95 to Fredericksburg VA. If all goes well, it should only take a couple of hours.